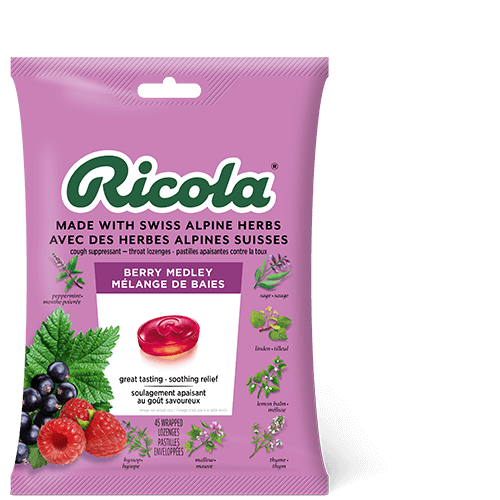 Vitamin C 34.92 mg, extract of Ricola’s herb mixture 18.4 mg: lemon balm (melissa officinalis) aerials 4.6 mg [1.33:1, QCE 6.1 mg], peppermint (mentha x piperita) aerials 4.6 mg [1.33:1, QCE 6.1 mg], thyme (thymus vulgaris) aerials 2.76 mg [1.33:1, QCE 3.7 mg], hyssop (hyssopus officinalis) aerials 2.48 mg, [1.33:1, QCE 3.3 mg], sage (salvia officinalis) aerials 2.48 mg [1.33:1, QCE 3.3 mg], elder (sambucus nigra) flower 0.46 mg [1.33:1, QCE 0.6 mg], linden (tilia cordata) flower 0.46 mg [1.33:1, QCE 0.6 mg], horehound (marrubium vulgare) aerials 0.18 mg, [1.33:1, QCE 0.24 mg], mallow (malva sylvestris) leaves 0.18 mg [1.33:1, QCE 0.24 mg], wild thyme (thymus serpyllum) aerials 0.18 mg [1.33:1, QCE 0.24 mg]. Non-medicinal ingredients: Sugar, glucose syrup, citric acid, raspberry juice concentrate, black currant juice concentrate, bilberry juice concentrate, natural flavours (menthol, peppermint oil, black currant, wild berries), colourant (carrot extract, hibiscus extract). Recommended use or purpose: Source of antioxidant for the maintenance of good health. Recommended dose: (Adults and children over 12 years of age): Dissolve one lozenge slowly in the mouth every 1– 2 hours up to maximum of 8 lozenges per day. Cautions and warnings: Consult a health care practitioner prior to use if you are pregnant or breastfeeding. Do not purchase if package is open.